We have developed a wind turbine for residential & industrial power generation, which is installed on rooftop or ground & collects wind energy from the atmosphere and converts it into electricity. As average wind speed in India is around 5-6 meter/sec. 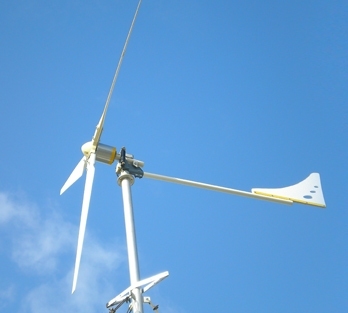 Thus our wind turbines are specially design for low wind speed. Our wind turbine will start the generation at the wind speed of 1.5 mtr/sec & reach to its rated output at around 6-7 mtr/sec, which provide more output compare to the other wind turbine of same capacity. When the charge current is high in strong wind, controller can load the wind turbine automatically by passing extra power to dump load. And charging the battery with low current. The wind turbine loads uniformly with fully loaded all the time.